Day… It’s almost over of 30. – 30 Day Detox… What?? I can’t believe how close to the end I am! I’ve done really well, and I’m pretty proud of myself. I’m keeping in mind all of the great things that have changed over the past four weeks as I’m looking down the barrel of the next 30 days. The goal post-detox is to land somewhere in the 80/20 zone with food. I’ll, permanently, add back in those things I don’t have a reaction to, and avoid the other stuff. Adding foods back into my diet is another process I have to go through, which I’m only sort of ready for. I haven’t read any of the reintegration information I was given. Can you say “fear of the unknown” with a side of “procrastination”? It’s so dumb. Seriously. But I haven’t. I’d better get educated by Monday, though! The last few days have been interesting. I did learn about one food allergy ahead of time. Tamari sauce makes great stir fry AND makes my mouth, tongue, and throat swell up. It was probably only half as scary as I think it sounds. A couple of days of Benedryl and I was ok. I didn’t really feel like blogging though! I also learned how difficult it can be to find things to eat in restaurants that fit the requirements. I highly recommend scoping out the menu online beforehand. Go in with a plan! I didn’t, and I might’ve had a little internal melt-down. Just a little. At the same time I was desperately searching for ANYthing safe to eat, I was imagining ordering with 10 instructions for my meal that would make the waitress and/or the chef spit in my food. Thankfully, I found the one thing on the menu I could eat with a request to make it a lettuce wrap rather than a tortilla. 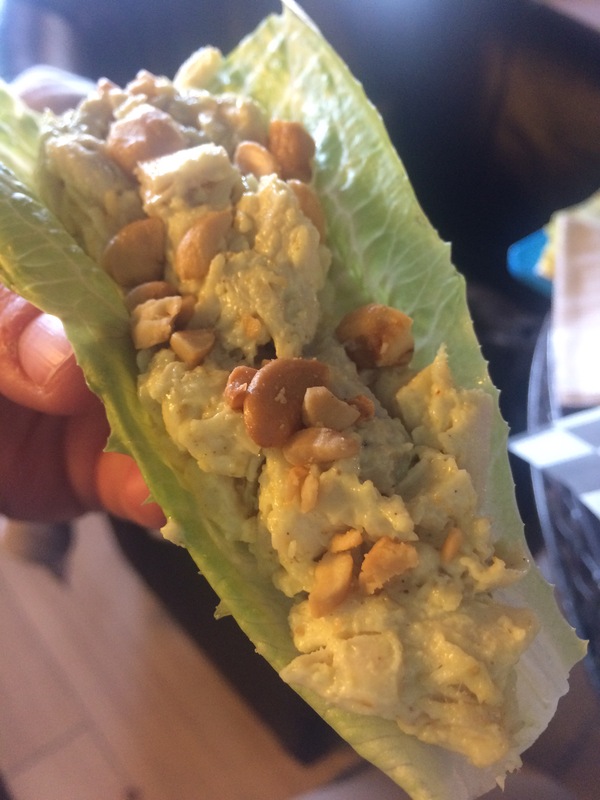 Chicken curry salad with coconut milk and cashews. It was great! We’ve continued to have good meals. 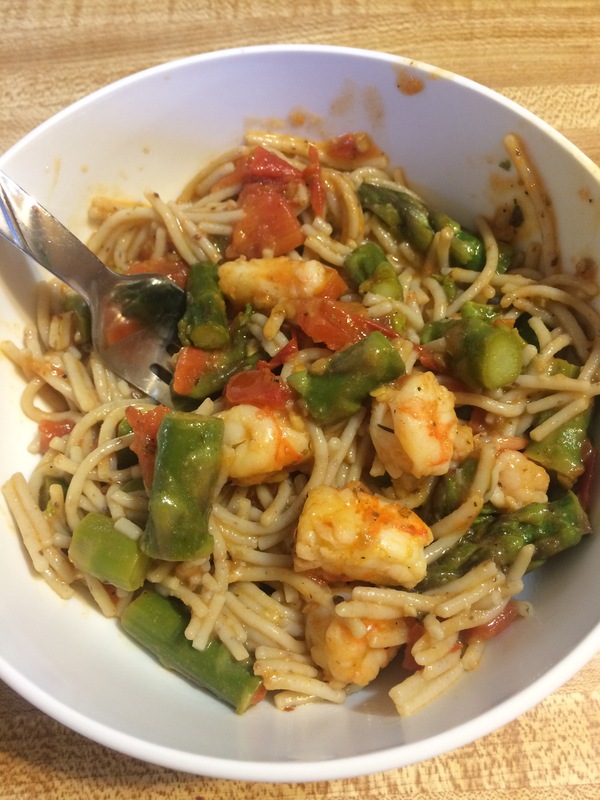 Tonight we made shrimp with a light tomato sauce and asparagus over pasta. I’m happy to share recipes if anyone is curious! I’m looking forward to Easter weekend with my family. Interested to see how Easter dinner goes. I’ll keep you posted! Previous: Previous post: Day 22 of 30. The Home Stretch! Next: Next post: Day 28 of 30. Fire!